The Snowden Law Offices welcomes you to our little corner of the Web. Click on the tabs to learn more. This site is still in the construction phase, so feel free to check back with us later to get updates and more detailed information. This site is updated monthly and we publish an e-newsletter. If you would like to sign up to receive this free newsletter, please click on the contact us page and fill in the information requested. We are a general practice full service law firm providing for the needs of our clients throughout the state of Alabama for the last 20 years. The firm now offers Saturday and after hours appointments on request. The firm has received a BV rating from Martindale Hubbell attorney rating service, the highest rating based on years of practice. The firms offers a range of legal services to non-profits. We now accept all major credit cards including MasterCard, Visa, Discover and AMEX. 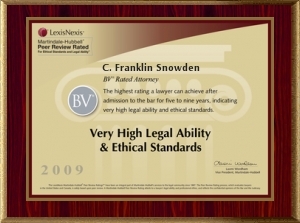 Copyright 2006-15 The Snowden Law Offices, P.C.. All rights reserved.